1. From Manila – go south on the South Expressway (SLEX) until the end of the tollgate. 2. Go straight and travel 7.5km to the start of STAR Tollway. 3. 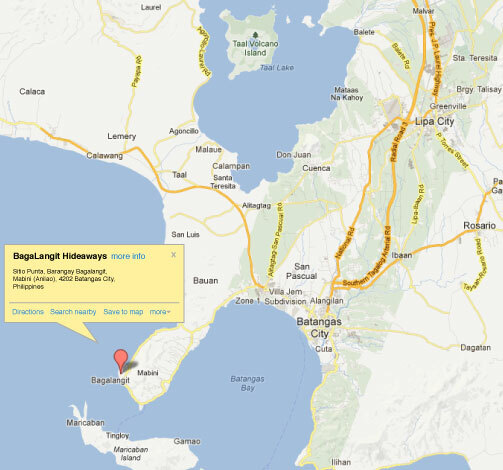 Enter STAR Tollway and go to the very end towards Batangas City. 4. At the end of STAR Tollway, at the rotunda, cross Manila-Batangas Highway and go onto Diversion Road toward, Batangas International Port, and travel 3.5km. 5. RIGHT turn under over-pass onto Batangas-Balayan Highway towards Bauan. 6. RIGHT turn at Buedia St. (Jollibee at the corner) and follow the main road. 10. RIGHT turn on Bagalangit Hideaways entrance road (Balitan Road) and just follow the road. Careful STEEP DECLINE. WELCOME GUESTS!